Home > Miscellaneous > Do you have Negative Rh Type Blood? You May Be come from Another Planet with Anunnaki !! 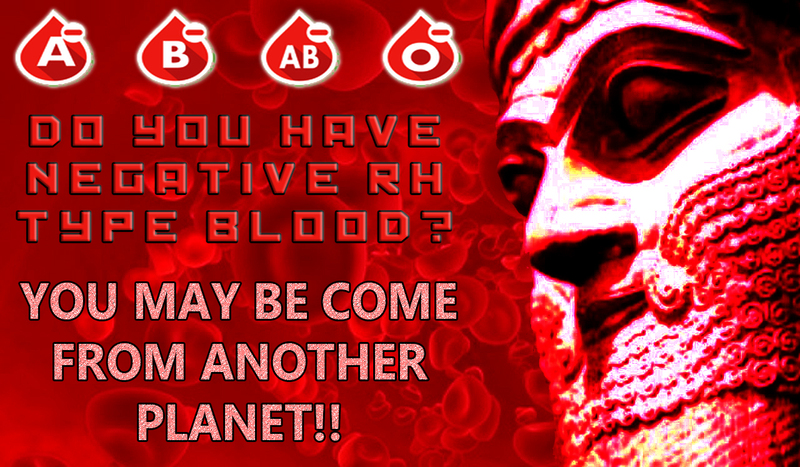 Do you have Negative Rh Type Blood? You May Be come from Another Planet with Anunnaki !! If you are one of those who have the negative Rh Blood group, this Video may interest you, because although we do not know very well what scientific basis of this theory has. It is said that the negative Rh is born from a genetic modification in the past by an extraterrestrial origin. This origin is better known as the Anunnaki. In the primitive era, before the problems they suffered in the atmosphere of their planet. Humans have four possible types of blood: A, B, A B, and O; This classification is derived from proteins found on the surface of cells, designed to fight bacteria and viruses. In recent studies, have shed more light on the negative type of Rh. The analysis shows very unusual features and its composition that do not fit with the known human. That blood type are very mysteryus. The population of Rh negative is very reduced worldwide, as it barely reaches 15%, which makes the mystery more alive. One factor worth considering is that, Apes, the grandfather of homo sapiens according to Darwin's Theory of Evolution, they do not have Rh negative blood groups. Also, It is a matter of great surprise that, If a woman with Rh negative blood becomes pregnant with an Rh positive baby, her body will produce antigens signaling to her immune system, that her fetus is essentially toxic and the woman’s body will destroy its own fetus. The negative Rh is totally different from the normal Human or Homo Sapiens. How is this decisive difference explained? Various scientific investigations have focused on the search for an answer; Now, a surprising and fascinating theory has emerged: in a remote time, extraterrestrials would have visited Earth and created negative Rh Blood group. This theory goes back to the ancient Sumerian culture, for which there existed a origin of beings that came to Earth from the space. The Anunnaki, who built the first human societies. They would have had the plan to genetically alter primitive human beings to create a kind of strong beings, that could be used as working class. The negative Rh would be the legacy of the passage of the Anunnaki for our planet. Currently, the negative RH strain is characteristic. This hypothesis has certainly not been confirmed, despite the disturbing questions it generates floating around in the air: how would the civilized world react, if they were realized that, a small portion of its population has a genetic manipulation by extraterrestrials?